I climbed into my truck before dawn this morning, and dragged girlfriend Maria Thomas out of her bed to accompany me to Rainbow in hopes of seeing to my livestock's safety and my farm's fate. We were stopped, same as before, at Rainbow Glen Road. This time we were able to take Mission Road, which was open for Rainbow residents East of the 15. Again, CHP professionals were kind and supportive, but firm. No one passes. It was suggested that I get in touch with animal control to see if they'd go up and check on livestock. We hung around with the small crowd of would-be Rainbow Glen Road returnees for a few minutes and were thrilled when animal control happened to stop by. They were very happy to take my farm address and check on my animals. They suggested I return to my evacuated position and wait for a return status call, as they had numerous farms to visit in the little Rainbow Glen Valley. 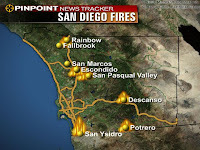 Precious little is out there for the worried residents of Fallbrook and Rainbow, but here's what I've gleaned from other blogs: The Rainbow fire as of 8:30 p.m. Tuesday night is only 10% contained, is currently burning on Rainbow Glen Road, which is the road Morning Song Farm is on. In this "Rice Canyon" fire, 206 homes, 40 outbuildings, 91 vehicles and an astounding 20,000 avocado trees in 7,500 acres have been consumed by flames. No word about livestock rescue efforts. The near-total news blackout of Rainbow continues to leave us very frightened, but hopeful. Roads are currently shut down for returning evacuees, but if there is anyway I can get into the area to feed, water and check on my animals, I will at daybreak. There will be no Tuesday baskets today, farm is evacuated, Rainbow Glen Road shut down. There is a mandatory evacuation in place in Fallbrook and Rainbow. Not much news is available for the "Rice Canyon Fire" which includes Rainbow. Animal rescue services were unable to get to our farm to bring our herd of llamas to safety. Much of Fallbrook and Rainbow is being evacuated, although the crew at Morning Song Farm says they see no immediate danger. I'd drive out there myself, if nothing else but to move llamas and chickens to safety, but noone is being allowed into Rainbow at this time. Weirdly, MSF's crew just finished up the fruit harvest for tomorrow's baskets, and says they'll do the vegetables and herbs tomorrow morning, as usual, unless something changes. Please do check this blog for emergency developments; questions such as: can our driver get into Rainbow southbound from Temecula and pick up baskets for Orange County's deliveries? have been left unanswered at this time. More news: grove manager Rufusio just called to report the majority of 07-08 avocados have been blown to the ground. Don't forget to pick up your baskets! We had a witcher come out to the farm this weekend and douse. If I'd known how cool it was to watch him, I'd have made a party out of it and invited everyone to tag along. He used an obviously well-worn prong and walked along until the prong swung down on its own, indicating water. We walked back and forth across a couple separate areas until he found what he explained is the center of the vein, which is where a well should be drilled. We've contracted him to drill a well for us. There is no guarantee he'll actually hit water, but the alternative is cutting down 1/3 of our trees, so we're drilling. And praying. This is a very busy month for us! We're planting both the shell peas and the pod peas, along with more garlic (lot's more). Last year we mistakenly cut the new green sprigs of our garlic when it reached 12 inches, thinking the garlic would just grow another sprig. It did, grudgingly. The cloves aren't as big as they should be, so this year I researched how to specifically grow Garlic Chives. They're planted with the intention of eating them before they've grown into a new clove, and are spaced tightly, like seeding the row for beets. We ordered an enormous quantity of seed to try our hand at growing this delicacy correctly this year.We're also preparing the soil for our regular garlic and potato planting. And then the usual: more lettuces, (now that's it's cool they'll be easier to grow), brocolli, more beets (this time we're trying an heirloom yellow beet), more chives, shallots. Tuesday baskets are ready to be picked up after 2:00 at the farm, and after 4:00 in San Clemente. Wednesday's baskets are ready to be picked up after 5:00 in Costa Mesa and Santa Ana. Enjoy! Baby Bok Choi -Looks like a very small head of Swiss Chard. Tastes a little stronger. Can be cooked like spinach, or Swiss Chard. Also good in a quiche. Sometimes I forget what isn't really mainstream and assume everyone will be able to identify the basket's fruit. That happened last week with our delicious Fuyu persimmons. The fattened, orange-colored, shiny orange fruit that looks something like a tomato, is a persimmon. You can eat it like an apple. I like the skin. This fruit also makes a premium dried-fruit product. Slice in thin layers and dry out of direct sun. We have to pick them when they still have a little green blush on them because of wiley coyote's fondness for the tree-ripened ones. If there's still a little green on yours, let it sit on your counter for a few days. Holly Teipe shares this super-simple recipe for baked Zucchini -- Farmer Donna"I made a great dinner tonight with items from my basket. Baked zuchinni with veggie sausage, bread crumbs, cooked onion, a little salt and pepper, and the argula mixed with a mustard vinegrette.Delicious.Pic included. Thank you!"